Sir William Gregory, Speaker of the House of Commons, was a key political figure in the days of King Charles II, and was one of the most important men in the national context ever to live, and be buried, in the Ross area. Today we can enjoy the legacy that his wealth and influence left us in the form of two fine buildings at How Caple. He was born in 1624, the son of the vicar of Fownhope, and went to Hereford Cathedral School. His father acquired Hill House at Woolhope, a property that Sir William subsequently enhanced. This was demolished in 1846, but its Victorian successor, known as Wessington Court, still stands on the site, having become a school and then turned into flats. William was astute enough to develop a successful and lucrative legal career both through the years of the Commonwealth government and into the years of the Restoration of Charles II. Then in 1678 he was returned as member of parliament for Weobley. Having been in the Commons for less than a year, he was elected Speaker, in which post he oversaw the enactment of the important Habeas Corpus Act. However, after a short time he vacated the job in order to be appointed as a Baron of the Exchequer (a legal, rather than a political position). But these were turbulent times in politics. Following the Civil War, the powers of the restored monarchy were still in a state of flux and William angered the King by giving a judgement which went against certain of the royal powers. He soon found himself removed from office, but after a brief spell as MP for Hereford he was appointed a judge of the King's Bench. He carried out this role "distinguished for his firmness and integrity" until shortly before his death in 1696. Because of his various metropolitan involvements, Sir William spent most of his time in London, but in around 1670 he bought the How Caple estate from Edward Capel, whose family had lived there from medieval times. To the south front of the Court, looking down the Wye, he added a smart new range in the latest fashion. This front is a simple, symmetrical design of classical proportions under a hipped roof, and still survives today, although with some later windows inserted. The terraces stepping down from it are probably of the same date and can be compared to the contemporary terraces at Powis Castle, the National Trust property in mid-Wales. Sir William's greatest local legacy is How Caple Church, which he largely rebuilt as a fitting burial place for himself and his family. The chancel, largely dating from the 14th century, was restored, but between 1693 and 1695 the nave was rebuilt, a new west tower was added and also a new south chapel for his family use. The 1690's are a rare date for church building outside of London. Medieval churches were still generally in reasonable condition, there was no great increase in population and in Herefordshire there were few landowners rich enough to provide the necessary funding. What is intriguing about How Caple is that the re-build is in such an authentically correct medieval Gothic style. This was, after all, the period when Sir Christopher Wren designed St. Paul's Cathedral and rebuilt the City of London churches after the Great Fire in a variety of classical and baroque styles, all of which Sir William must have been familiar with, But he obviously felt it appropriate that his rural estate church should be in traditional Gothic, perhaps identifying the classical and the baroque with dangerous continental Catholicism. The Gothic work was carefully done with window tracery either re-used from the earlier church or carefully replicated. It is difficult to tell that the exterior is not genuinely medieval. 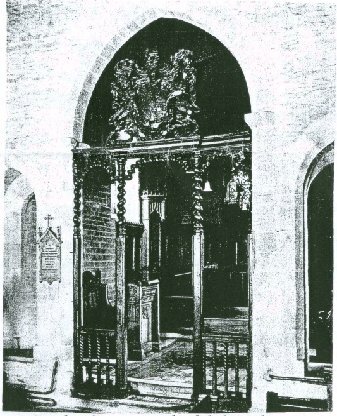 Perhaps the only giveaway arises because Sir William did not skimp on the costs of the work, and the new parts are built in finely cut stone (in contrast to the rubble stone of the medieval chancel) Inside the church was beautified with a charming open wooden screen dividing the chancel from the nave. It stands on slender square posts which in their upper stages change into barley-sugar twists supporting barley-sugar arches. Over the top is a large royal coat of arms for William and Mary carved in wood. The ensemble is very unusual. Sir William lies buried under a ledger stone in his family chapel, along with other members of his family, but his work on the church and the south front of the Court can still be enjoyed today. In about 1900 a subsequent owner of the estate, Lennox Bertram Lee, made his own important contributions, adding to the Court in an Arts and Crafts style, laying out Italianate gardens below the terraces, and enhancing the interior of the church, especially with fine stained glass. But it is Sir William Gregory we must principally thank for the unusual, but comparatively little known, legacy he left us.